The new Picotest G5100A Waveform Generator uses direct digital synthesis (DDS) techniques to create a stable, accurate output signal for clean, low distortion sine waves. The G5100A offers 10 standard waveforms and user defined arbitrary waveforms with 14 bits resolution. It also provides you 16 bits pattern out and a synchronized clock. 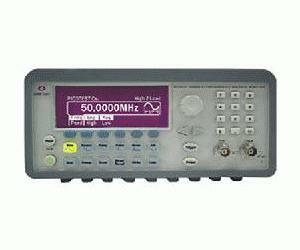 Moreover, the external frequency reference lets you synchronize to an external 10 MHz clock. The G5100A has intuitive panel operation; the menu is structured and convenient. All shortcut keys are fast and easy to access. The G5100A provides you the flexibility to create the waveforms you need. Also you can store up to 8 waveforms (8 x 64K points) in nonvolatile memory.